The Bakewell tart is a traditional English dessert or cake that has developed from the Bakewell Pudding, although the modern tart is quite different form the original pudding. Bakewell is a small town in Derbyshire, England and local legend has it that it was eaten as far back as the 1500s at Haddon Hall. More popular belief is that the actual appearance of the Bakewell Pudding was 300 years later in the 19th century. The Bakewell Pudding was first created in the 1860s when Bakewell's coaching inn was the White Horse. The White Horse was built in 1804 on the site of an earlier inn. Back in the coaching days it was the landlady of the White Horse, Mrs Greaves, who usually did the cooking but on the monumental day, when entertaining important guests, the task of making a strawberry tart was left to an inexperienced assistant. The egg and sugar were omitted while making the pastry. Then the jam was spread over the unusual pastry base, and the egg and sugar mixture was put on top and an extra (secret) ingredient was added. The customers liked this new sweet, and the rest is history. 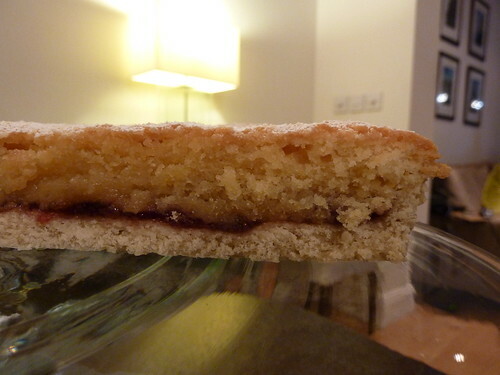 Modern day Bakewell tart consists of a shortcust pastry base, spread with jam and covered with a sponge-like filling enriched with ground almonds (known as frangipane). The thing I like about bakewell tart is that it makes a great warm dessert with cream or custard but is equally good as a nice slice of ‘cake’ with afternoon tea. 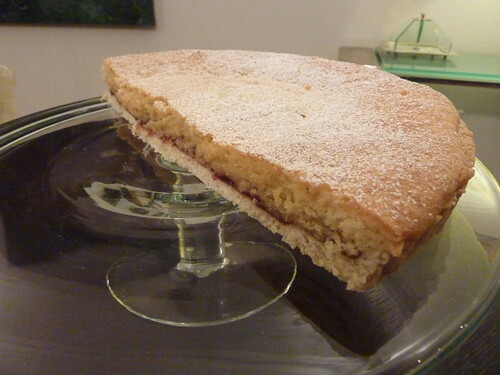 My recipe is a combination of different recipes and techniques but I think makes the perfect Bakewell Tart. To make the pastry, sift the flour into a mixing bowl and stri in the sugar. Ten rub in the butter using the tips of your fingers. When the mixture resembles breadcrumbs add the lightly beten egg a bit at a time to bring it together to a smooth dough. It should leave the bowl clean but not be sticky. If you have added too much water then add a little more flour. Knead it for a couple of minutes and then leave it to rest in the fridge for 30 minutes in a polythene bag or cling film. Once rested roll out the pastry so it is slightly bigger than the dish you are using. Carefully line the dish with the pastry ensuring there are no gaps. Overlap the edges by about 1 inch as the pastry will ‘shrink’ when it is cooked. ‘Blind-bake’ the pastry for about 20 minutes i.e fill the pastry case with baking beans if you have them and bake the pastry so that you do not end up with soggy pastry when the tart is cooked. Once the pastry has been blind-baked take it out of the oven and leave it to cool (it is not essential it is completely cold before the next stage). Cream the margarine and sugar together using a wooden spoon or electric mixer until light and fluffy. Add the eggs one at a time and beat into the mixture. It is a good idea to add one tablespoon of flour before the last egg to stop the mixture separating. Mix the almond essence with the milk and beat in to the mixture. Then fold in (using a metal spoon with a figure of 8 movement) the remaining flour. Mix a few tablespoons of jam in a bowl so that is becomes runny and then spread this on the pastry case. Cover the entire base. Then add the grated marzipan on top of the jam. It looks like you are adding cheese but don’t be put off!. Then spoon in the frangipane filling ensuring no jam or marzipan is visible. Add it carefully so that you so not mix the jam or marzipan into the mixture but it stays under the frangipane. Bake in the oven at 200 Centigrade (400 Fahrenheit, gas mark 6) for 20 minutes and then turn it down to 180 centigrade (350 Fahrenheit, gas mark 40 for a further 15 minutes. The sponge should be firm but ounce back up when you press it. Some people like to add pastry to the top or even ice the tart but I think it is great as it is. Great looking tart. Definately looking forward to tasting this soon. You are an absolute star - thank you for taking the time to post such clear instructions, and please please post more!!! Hi, this a fantastic recipe, and so easy to make. Thank you for posting this - never fails to turn out fantastically!